May around here means Cinco de Mayo celebrations, and that only means one thing: margaritas! 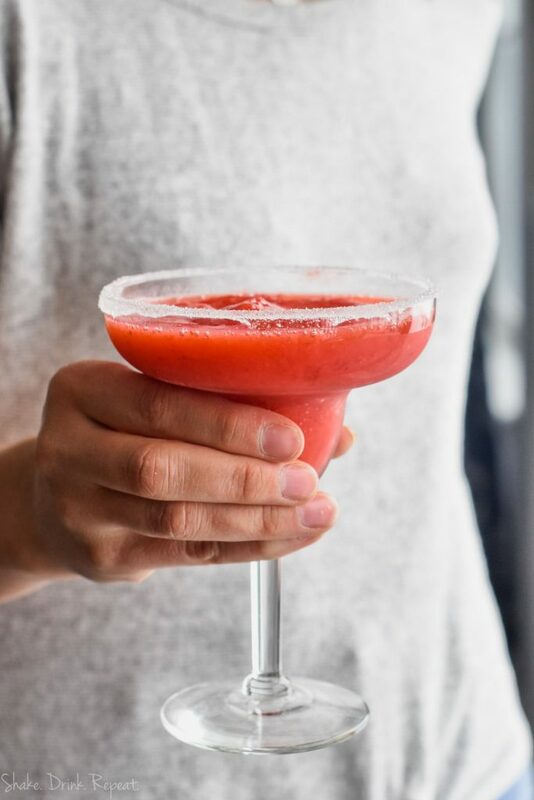 (And chips and guacamole, obvs) More specifically, this sublimely sweet and simple Strawberry Margarita. If you’re more on top of things than I am, you’re no doubt already planning a Cinco de Mayo fiesta the likes of which your amigos have never seen. 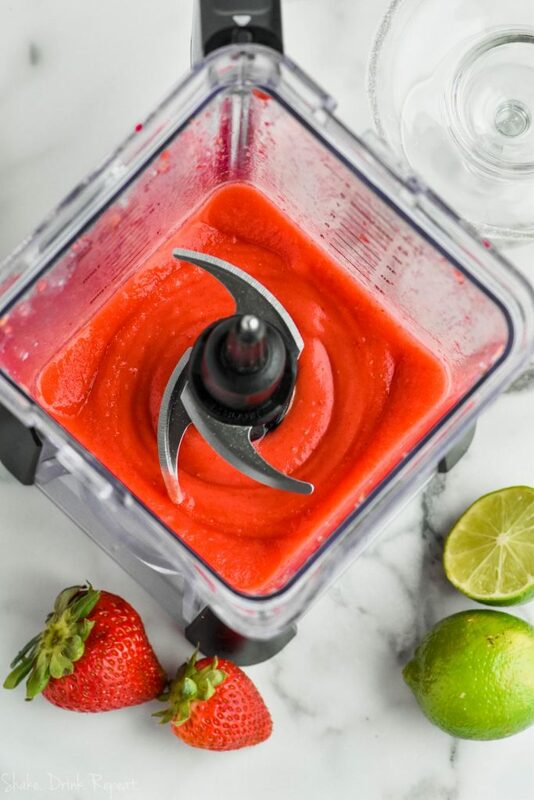 But if you’re still mentally stuck back in February, mix up a batch of this delicious frozen strawberry margarita recipe and you’ll snap into the here and now pronto! Or try this Raspberry Lemonade Margarita or Sunny Orange Margarita for a refreshing, warm-weather treat. 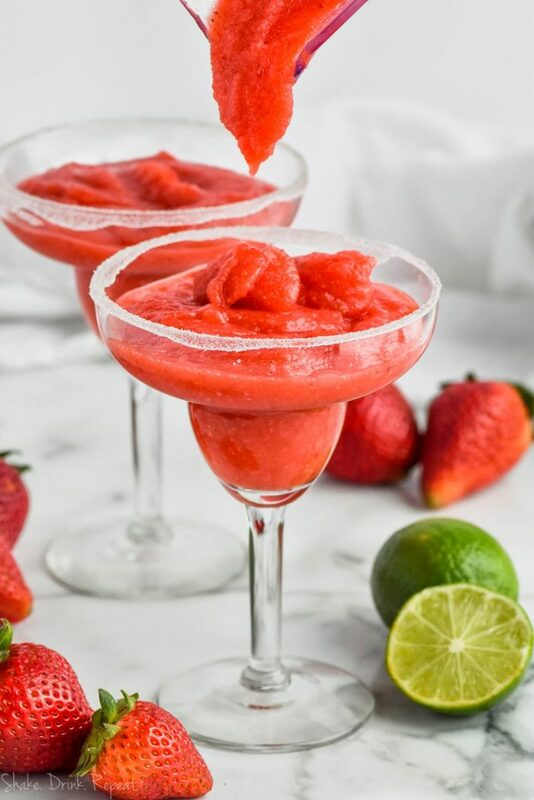 WHAT DO I NEED TO MAKE A STRAWBERRY MARGARITA? A batch of Sweet and Sour Mix. 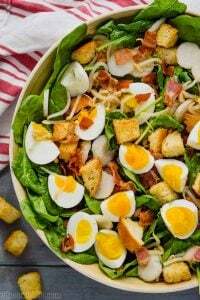 It’s quick to whip up and can be used in dozens of delicious recipes. Tequila! Good quality tequila is key to making a really great batch of margaritas. Triple sec or orange liqueur, whichever you prefer This Blood Orange Margarita recipe is a good one too! Frozen strawberries. If you have fresh berries on hand, by all means toss them in! Just add a few ice cubes for a frozen texture. 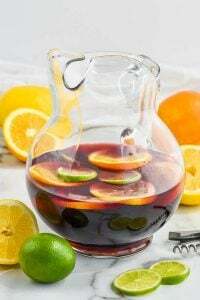 For a great big pitcher of this margarita recipe (and trust me, you’ll want a big batch) mix your good quality tequila, a cup or so of the homemade Sweet and Sour Mix, a half cup of triple sec or orange liqueur and about half a dozen cups of frozen strawberries in a blender. Mix until smooth and serve in a sugar rimmed glass immediately. On the rocks or frozen, this refreshing margarita will be a summertime favorite long past Cinco de Mayo! Still need a few more margarita ideas? Try this low-calorie Skinny Margarita Recipe, or for a brunch beverage, sip on these Mimosa Margaritas. 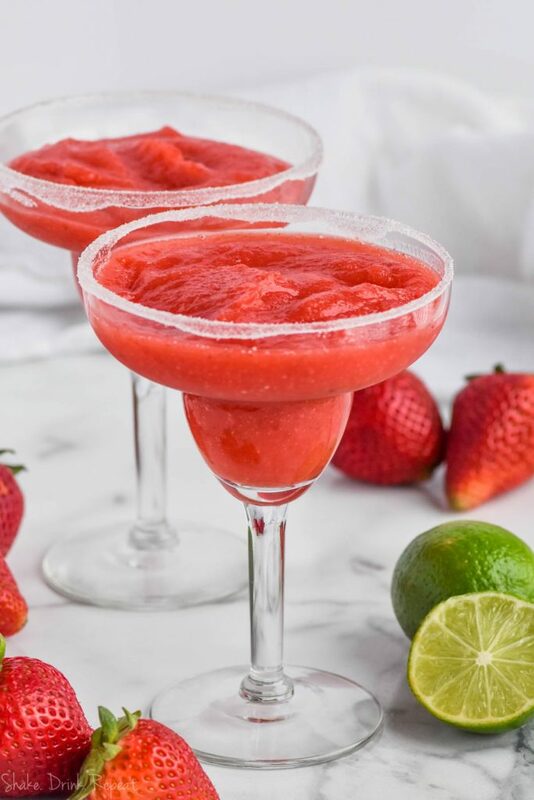 This Strawberry Margarita recipe is so simple but so delicious. 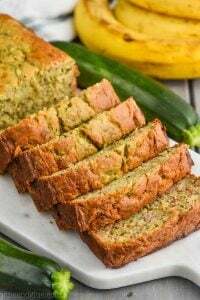 Make a small batch for just you, or make a whole blender's worth for a party! 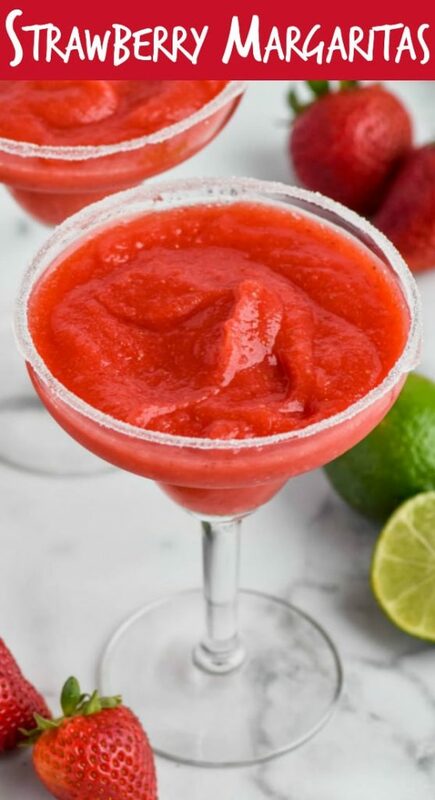 Add the sweet and sour mix, tequila, orange liqueur, and frozen strawberries to a blender. Blend until smooth. Using corn syrup, gently coat the rims of the glasses. 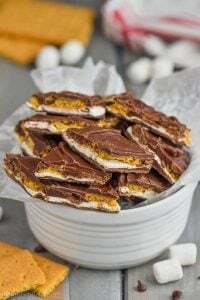 Dip the coated rims into sugar. 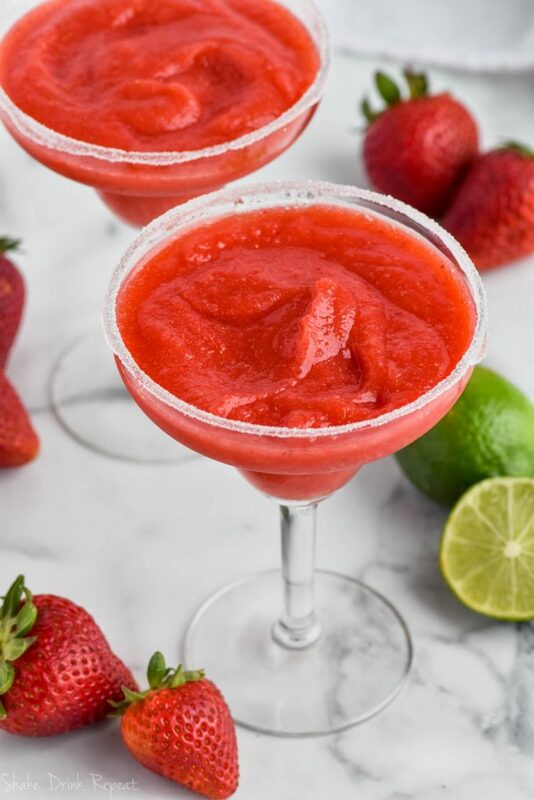 Fill glasses with strawberry margaritas and enjoy!